A couple months ago I posted my recipe for a Rosemary Collins. It was basically a Tom Collins that used a rosemary simple syrup instead of the usual plain one. I mentioned in the post that it’d probably make a great modernist drink, and this weekend I decided to test it out. First I had to clarify the lemon juice. 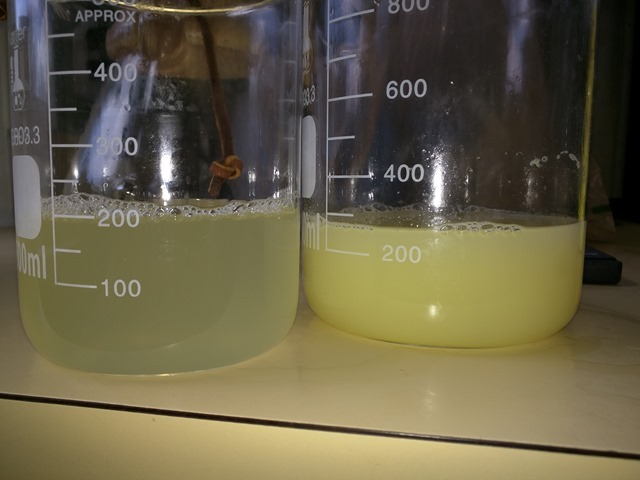 I wasn’t in a hurry (I had a few hours) but I had a lot of things to do and didn’t have the time to devote to agar clarification so I decided to try Pectinex, Kieselsol/Chitosan, and racking/filtering. I’d done that before with lime juice. It does work, it’s just low-yield and requires you to burn through a lot of Chemex filters. The process is pretty simple really. 1. Juice your lemons. I juiced 8 and came up with about 600ml of juice. 2. 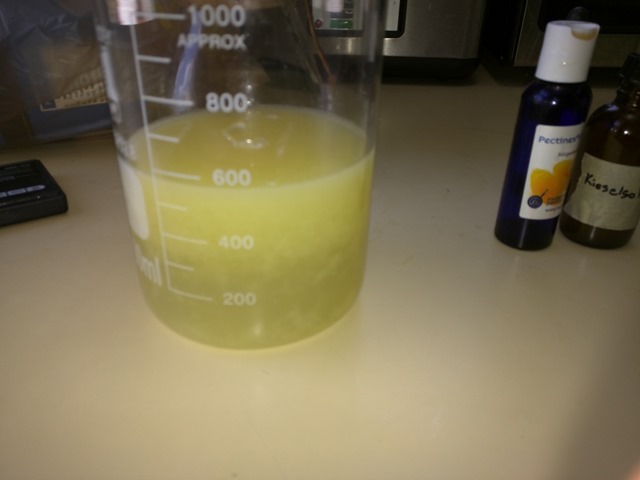 Stir in 2 grams per liter of both Pectinex and Kieselsol. (So in this case, about 1.2 grams of each.) Wait 15 minutes. 3. 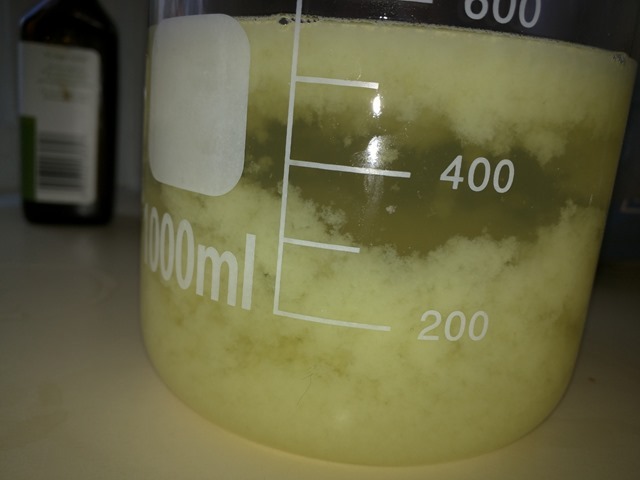 Stir in 2 grams per liter of Chitosan. Wait 15 minutes. You can see some separation is already occurring. 4. Stir in more Kieselsol, still at 2g/l. At this point I went and did some lawn work and came back maybe a half hour later. It had separated pretty well. This is the point at which you wish you had a centrifuge. I could see how you’d get a massive yield out of it. But I don’t so I filter through a Chemex. 5. Wet your Chemex filter. Pour about 200ml through. You’ll see a slow, steady stream at first, followed by some dripping, followed by almost complete blockage. At that point you can pick the filter up and massage it a little. It will speed back up. Eventually it will get so blocked that even this no longer helps, just pour what’s left back into the beaker and start again with a new filter. 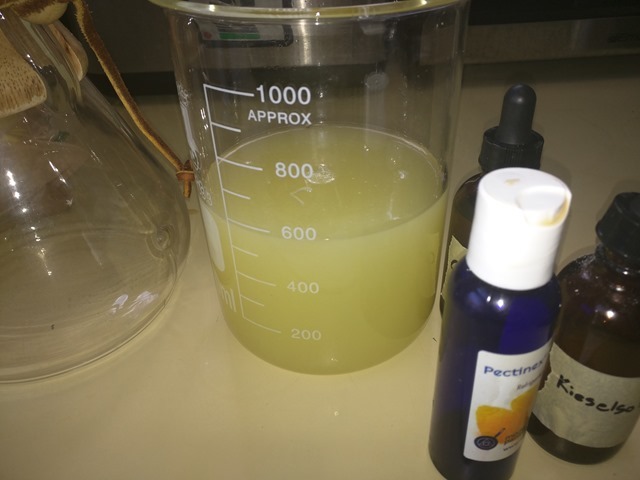 My 600ml of lemon juice came out to about 400ml of clarified. I only needed about 250ml for the cocktail I was working on, so I guess I got a little extra. This gives us a final ABV of about 13%. It was quite awesome. Everyone seemed to love it. I’d done basically the same cocktail a couple years ago, when I knew how to carbonate things but not how to clarify, and it tasted good but foamed out and ended up flat. It’s much better for the extra bubbliness you get from clarifying and is a great example of why you shouldn’t try to carbonate unclarified juices. This entry was posted in Uncategorized on May 6, 2015 by Genius.